Taint from jamie jones on Vimeo. Loving you and leaving you..
As the three of us prepare to move in to new phases of our lives, we've agreed that carrying Taint with us would cease to work any longer. So, with love and respect for each other as long-time brothers in this band, we're bowing out. We are proud to walk away, knowing that without compromise Taint has stood as the best and most unique band that the three of us could make it be. We'd like to thank our ex-members Darren Mason and Stophe Thomas, all of our fans for their support, and all our friends old and new who've helped us along the way. We know who you are, and we love you. Taint curates Oxjam in Clwb Ifor Bach, Cardiff. Joined by a stellar lineup of Wales' finest bands: Shaped By Fate, The Death Of Her Money, Sigiriya and Zonderhoof. This is a charity event for Oxfam International. Taint plus Sigiriya, The Groundnuts And Independents and 33. At Sin City, Swansea. We'll have a new batch of 'Heart Roots' t-shirts for sale at these shows, and for any future mail order inquiries. We'll continue checking in on our Myspace, Twitter and this here website to add any future Taint related news and activities. For now however, eternal love and gratitude. We're heading out for a mini-tour next month, with some headliners and supports to Eyehategod. Scandinavian dates also announced on shows page. Also released is the 'Falling Down II' compilation, featuring an exlusive live version of 'Black Rain'. Check it out! 'All Bees To The Sea' has been pulling in some great reviews, so here's a few below. We're also mounting up the show bookings, and have all listed below thus far. We hope to see you on tour later in the year too. More as and when. "A choppy, proggy, exploratory circle of excellency"
If last full-length ‘Secrets And Lies’ upped the ante for the Welsh trio, there should be quite a buzz surrounding Taint as ‘All Bees To The Sea’ demonstrates they’re one of the best bands in the UK right now. Featuring four new tracks plus a live recording of their blinding Roadburn 08 set, ‘All Bees…’ is a feast of honey-thick riffery, head-nodding and gutsy grooves and sharp-yet-sweet tempo lurches. There’s meaty melody with the doom-edged ‘Black Rain’, while ‘Prey The Wind Don’t Change’ holds a sting in its tail with harsh axework and biting, bile-covered vocal. Killer! 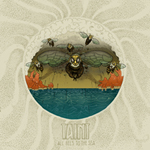 'Al l Bees To The Sea' - Out Feb. 7th! 4 brand new songs, plus full live set from Roadburn 2008. Ltd. 12" colour vinyl and CD. We're pleased to announce that our recent studio recording is seeing a limited vinyl release and CD on Destructure records. This will come in the shape of a coloured 12", and an accompanying code to download high quality MP3 versions of all tracks. This includes the new songs and full live set from our Roadburn 2008 performance. The CD will contain all tracks. This E.P is very much in the spirit of now, and includes all new songs that we're currently playing live. The Roadburn set is untouched, un-fixed and raw as a skinned dog. The vibe that night in Tilburg was electric and it comes across in this great document. We have live activity planned for the new year, with all dates at our shows page.